Wedding season at home always bells at our door with an enormous gift of happiness and cheerfulness. There’s an enthusiastic atmosphere at home. Each one becomes busy with some sort of work. However, the most important work is the wedding decoration. A hefty amount is spent only on the decoration part. However, there is always an alternate option through which you can save the money spent on decoration. You can do so by making your own wedding decorations at home. Home made wedding decorations aren’t difficult at all. All you need is different papers and funky materials. Creative minds can do this job with great perfection. They will definitely succeed in pleasing and attracting the guests. 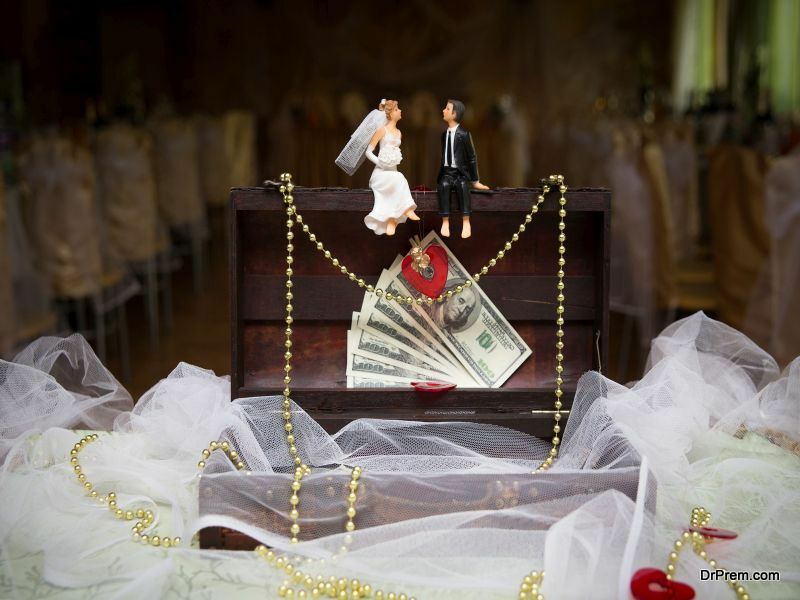 Wedding decorations made at home will leave everyone in sheer astonishment. Wedding invitations will look classy if bamboo boxes filled with homemade chocolates and a paper card are handed over to the invitees. You can make the entry of the bride and groom a little filmy by decorating the aisle with red rose petals. Apart from this, silver or golden colored stars which are readily available in the market can be stuck onto the floor for a memorable entry. Decoration using flowers are best when it comes to wedding. Vases full of flowers can be kept at corners of the hall. Flowers are a symbol of freshness and the sweet fragrance of the flowers when mixed with air invigorates the entire atmosphere. Paper flowers look best when multi-colored papers are used to make it. Such paper flowers can be made at home. You can place them at the centre of the table. White tissue papers can be used for making different flowers. Paper flowers can be decorated on the wall as well as besides the table where lunch is to be served. Garlands made up of paper flowers can be hanged from the wall or stuck on it using bright tapes. Balloons can be colored using golden color or decorated using different texture of colors for a bright wedding. Balloons can be kept anywhere on the floor or the to-be couple can leave the bunch of balloons high up in the sky. Centerpieces can be made from trash. Metallic boxes can be covered with beautiful and artistic materials like small mirrors or glitters or tinsels and kept at the centre. In that, paper flowers can also be placed. Bars can be decorated with glasses wherein sand can be filled. Then petals can be put on the top giving it a look of beach bars and a beach wedding. The wedding can be electrified with the help of chandeliers and mirrors at different places. They will reflect light coming from bulbs. Unused glass bottles with wide mouth can be used for decoration. Lights or small candles can be inserted inside them. Satin ribbons can be used for making abstract shapes and can be hanged from the ceiling. Also flowers of different shapes can be made using ribbons. For this, only some tape is required for sticking the ribbons into different shapes. Welcoming the guests can be done by putting up festive flags or making paper or flower arcs. Also to guide them to their respective tables, paper boxes filled with chocolates and their names on the top can be a good idea. These are few ways in which wedding decorations can be done at home.